Is Facebook marketing to promote your restaurant proving to be quite a challenge? Well, it need not be if you know how to go about it. Facebook is among the most accommodating social media platforms to connect and share information with your prospective customers due to its easy to use interface and multiple interactive features. To help you maximize on your marketing strategy, we will look at some effective and proven Facebook marketing ideas for restaurants. If appropriately applied, these approaches will help you leverage this social media giant to get the word out and fill your restaurant with loyal and paying customers. The quickest and simplest way of attracting customers to your restaurant is by creating awareness about the products and services you offer using quality pictures and live videos. Are you wondering how to create mouth-watering food pics to lure your customers? It’s easy. Facebook comes with an image editor that allows you to crop photos and add text and stickers. This feature enables you to design personalized restaurant memes to keep your customers engaged and motivated. You can also leverage the Facebook Live feature to stream and share live videos with your followers. Consider sharing live stream videos showcasing your restaurant layout and amazing furniture. You can also include cooking demonstrations and live streams of chefs preparing some signature dishes. Bottom line: Ensure that the video and image formats are compatible with cell phones since most customers are likely to visit your website using handheld devices. Again the food pictures need to be appealing enough. Remember not everything that looks good on plate turns out appetizing. There are two effective ways of keeping your customers: guaranteeing them excellent customer services and incorporating loyalty programs. Nowadays customers are more likely to research your business and products before deciding whether or not make a purchase. For this reason, it would benefit you more to offer both pre-sale and post-sale customer services on your restaurant’s Facebook page. You will be able to offer guidelines and resolve any complaints to change unhappy customers into loyal and repeat customers. Loyalty programs such as contests and giveaways are also useful in increasing your customers’ purchase frequency. For instance, host a “caption challenge” whereby you present a photo of one of your dishes or a funny event at your restaurant and ask people to provide their most creative captions. Now reward the one with the best caption with a voucher to eat at your restaurant. That way you will benefit from the increased online presence and repeat clients. Bottom line: It’s essential to ensure that your loyalty programs are a profitable exchange for you, either through increased engagement or more conversions. You might have done a great job creating awareness about your restaurant and the services that it offers but you will need to motivate your target audience to take the real steps toward becoming customers. Adding the Facebook Start Order call-to-action button is the best way to go about it. It allows you to eliminate any barriers your customers might encounter when ordering food from your restaurant. What’s more, your customers do not necessarily have to leave Facebook to place food orders. Bottom line: For you to be eligible for this feature, you will be required to use slice or Delivery.com for delivery. Reach out to Facebook and fill out this form to register. Now that you have included the Start Order button on your Facebook page, you need to provide your customers with your restaurant menu on your Facebook page. Such menus make it easy for your customers to go through your menu items and prices over the phone to simplify their food ordering process. Typically, when using the Facebook plugin to add a menu, the menu falls at the bottom of your Facebook page. But the best part is, you can use the “pin to top” feature to maintain your restaurant menu at the top of your Facebook page for enhanced visibility. Bottom line: Tell your customers where to find your restaurant menu using a status update. You can also create landing pages to promote your restaurant’s menu. Posting shareable content on your restaurant’s Facebook page is another effective way to grow your online presence and promote your restaurant significantly. Avoid lengthy articles and seek to optimize your visual content to accommodate cellphone users. Ensure that the content you share adds value to your audience to increase the chances of it being shared. Such content includes exciting facts relating to various dishes at your restaurant and step-by-step guides on how to prepare certain meals among others. Remember that proper timing when posting your content is crucial in increasing the likelihood of it being shared. Bottom line: Maximize on posting during the most productive hours based on the nature of your restaurant. For instance, if you are selling coffee, then morning hours are the most appropriate to remind your following to get a morning fix. Facebook ads offer a quick way to generate more traffic to your restaurant’s official Facebook page. These ads need to be captivating enough to encourage your customers to click on them and be redirected to your website. If your services are limited to a particular location, then geo-tagging ads could prove quite useful. Do you know what’s more effective than Facebook geo-tagging ads? Being able to target a specific audience to generate relevant traffic to your restaurant’s website. Luckily, Facebook provides all these customization features. Bottom line: There are various kinds of Facebook ads designed to suit various marketing or advertising requirements. Choose one that suits you best and consider establishing a reasonable ad budget. Even though you can promote your brand or restaurant through advertising, perhaps the factor most essential for continued growth and success of your restaurant is building a strong relationship with your customers. You should aim at turning your customers into ambassadors to help you promote your restaurant through word of mouth. 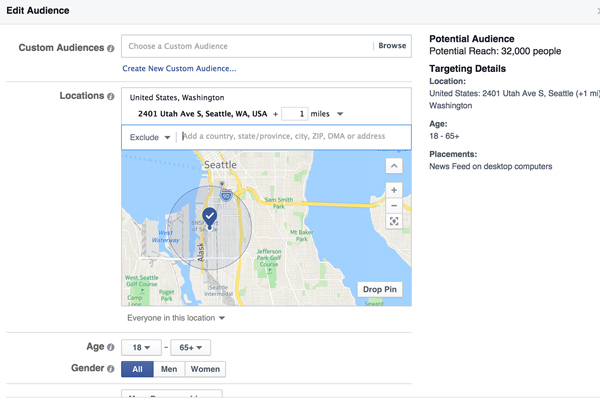 Are you having challenges connecting with your customers on Facebook? Here is the deal; respond to your customers’ comments on your Facebook page and address their complaints promptly. Also, do not ignore your current customers and always keep the communication lines open. Bottom line: You are more likely to connect with your customers more deeply if they feel appreciated. Therefore learn to value their opinions and let them know you recognize and appreciate their loyalty. From the above Facebook marketing ideas for restaurants, you will notice that using Facebook to promote your restaurant is not as hard as it seemed. All you need to do is to invest adequate time and leverage the right tools and features to reach your target audience.